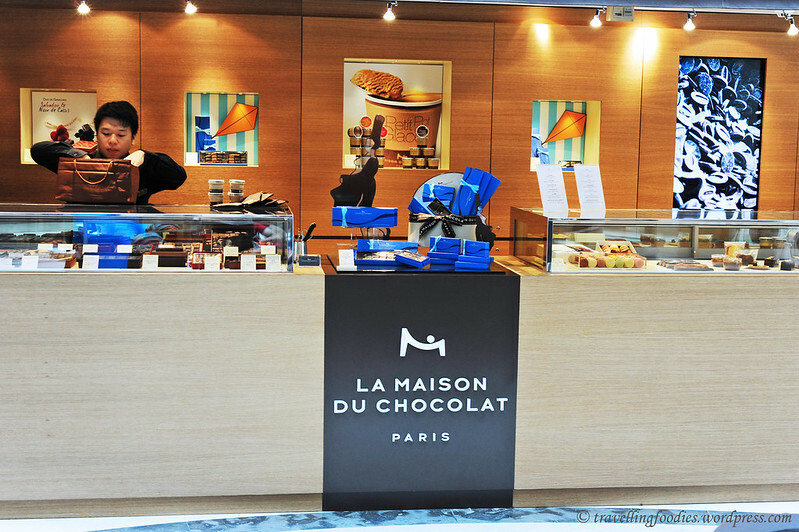 La Maison du Chocolat has its roots back in France. Paris to be specific. It “depui-ed” in 1955 and was later on taken over by the legendary Gaston Lenôtre . Since then it has expanded out of Paris, first to Cannes and then out of France to London, New York and Tokyo. 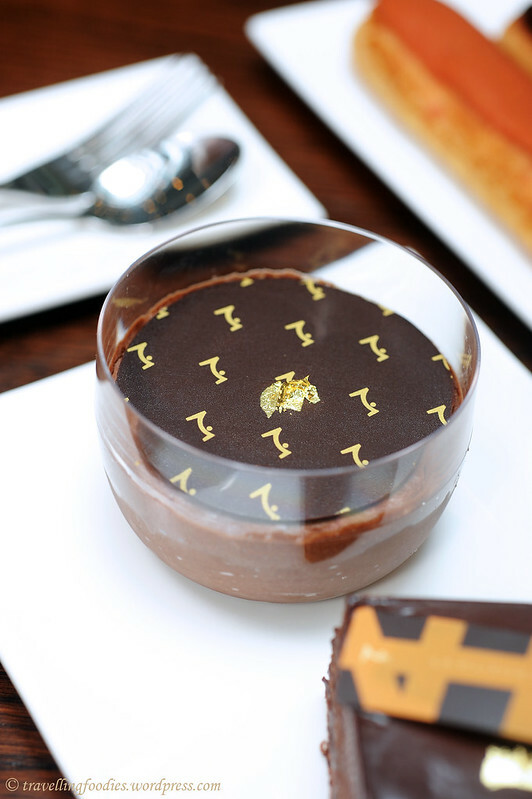 Hong Kong joins the list of of international boutiques most recently and being the closest to us, it was the perfect opportunity to sample what some have dubbed as “a little chocolate heaven”. 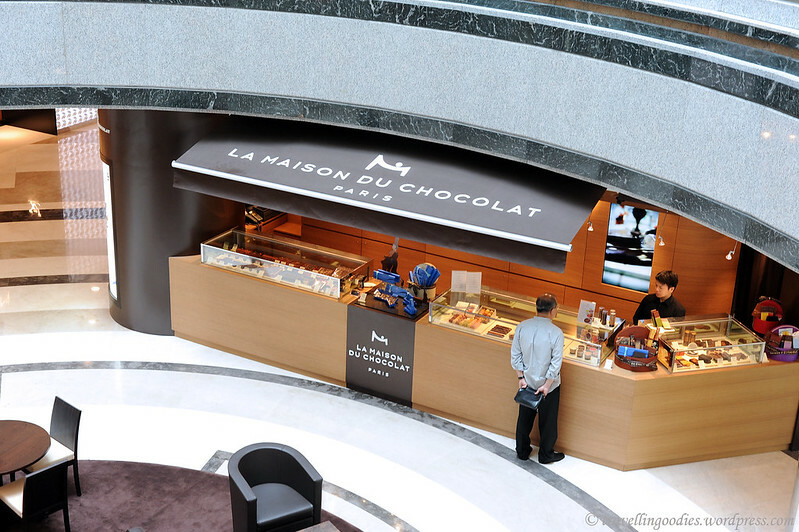 There are currently 5 outlets in Hong Kong supplying these little chocolate delicatessen in the form of ganaches, pralines and bon bons, all airflown from France. But we are more keen in sampling their menu in-situ. 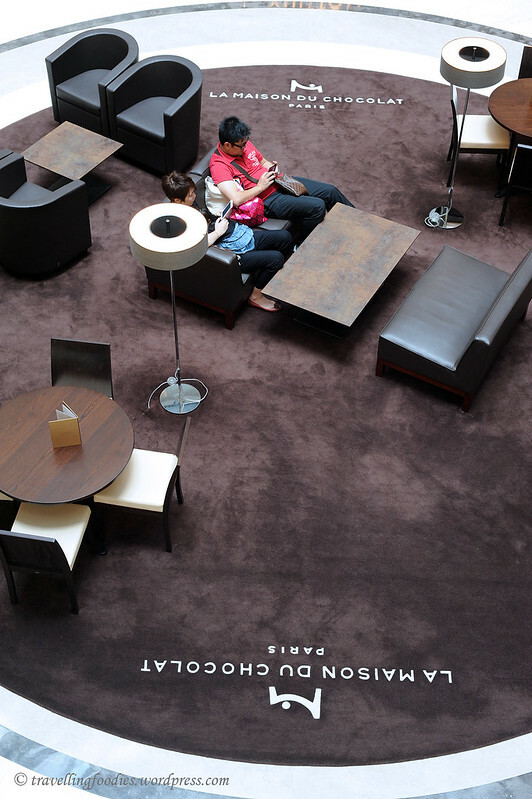 Hence, we opted for the one at Lee Gardens, Causeway Bay which has inhouse seating capacity. Their menu was rather small and quaint, confined to a selective range of items, some of which are featured in their wonderfully written recipe book. 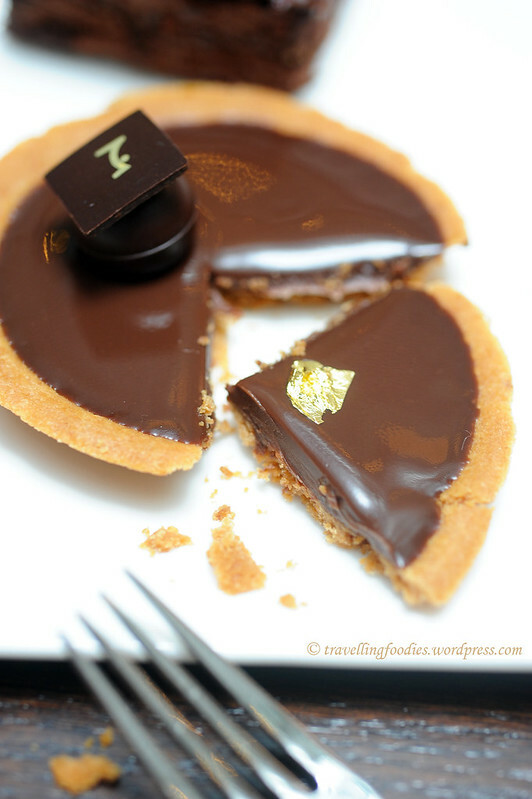 Tarte Chocolat aka Chocolate Tart is their signature item as recommended by the service staff and so right they were! This is argubly the best chocolate tart I’d tasted so far! 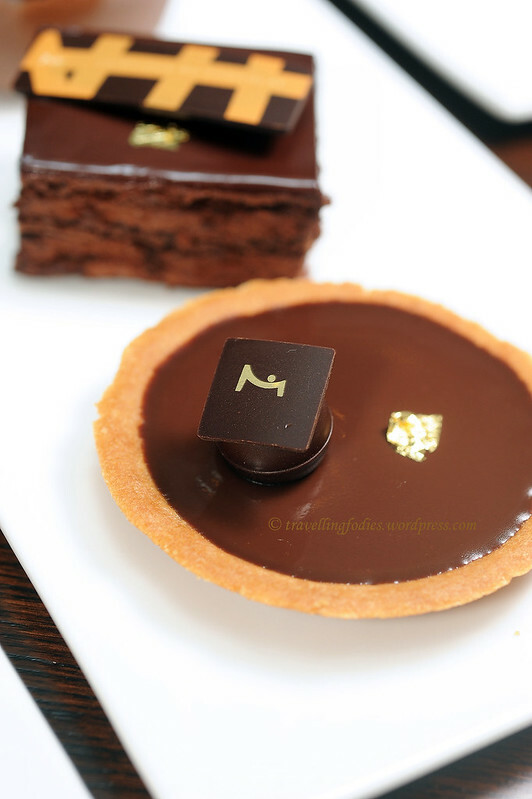 The pate sucree tart base was so aromatic and buttery , very prominent amidst the rich velvety ganache filling. I’m so glad that tart pastry speaks of its own qualities and not become overshadowed and merges into the background as a mere vessel. We thoroughly enjoyed the crumbly, shortbread like texture that beared much contrast against the smooth and luxurious ganache. The whole tart was kept minimalistic in presentation. With only a small feuille of edible gold and some chococlate decor. Such simplicity and yet such elegance . This surely goes down the list of one of the most memorable pastries I’d eaten. Then there is the Gateau au Chocolat. Rich and moist sponge layers sandwiched with more ganache from dark chocolat. Again, a good example that lack in complicated components is not in any way a lack in sophistication. 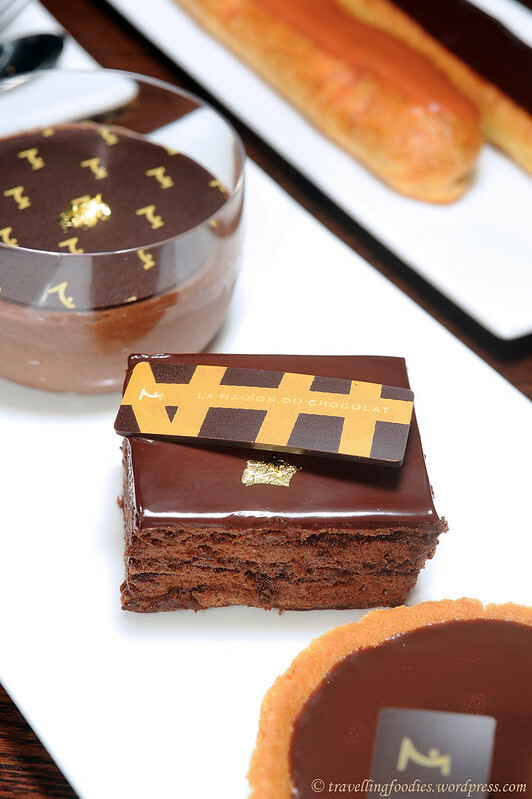 But be forewarned that it is a very very richly crafted cake, not only through the use of premium chocolates, but more importantly a wonderfful display of pastry mastery. So do not be deceived by its “innocent” looks. Yes, seldom have I been so blatant with my praises but this is surely worth every penny of what it costs. A cake for a true chocoholic so if you ain’t one, its best to order and share amongst friends. Otherwise, prepare to be overwhelmed by the sheer chocolatey lusciousness of it. And we ordered a Mousse au Chocolat as well! Since it was a full chocolate experience, what the heck right? 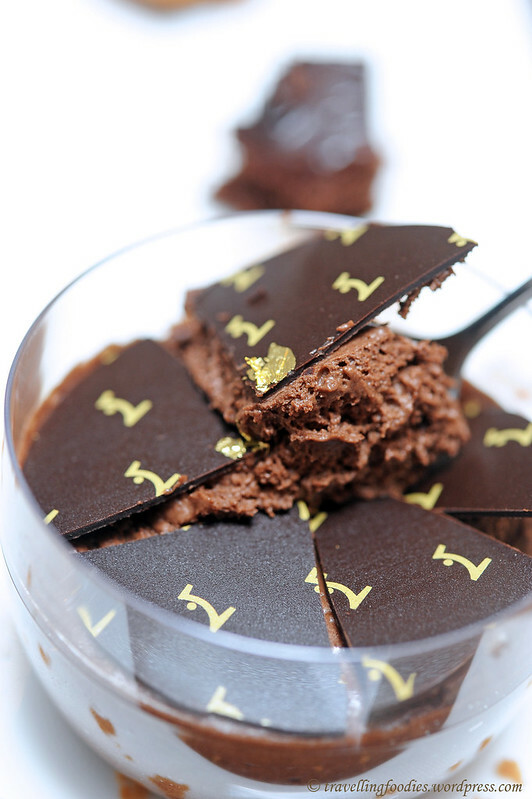 As anticipated, the mousse was very luxurious in taste but remained somewhat delicate in texture. Not being overtly cloying or bearing too much heft. This made it thoroughly enjoyable! 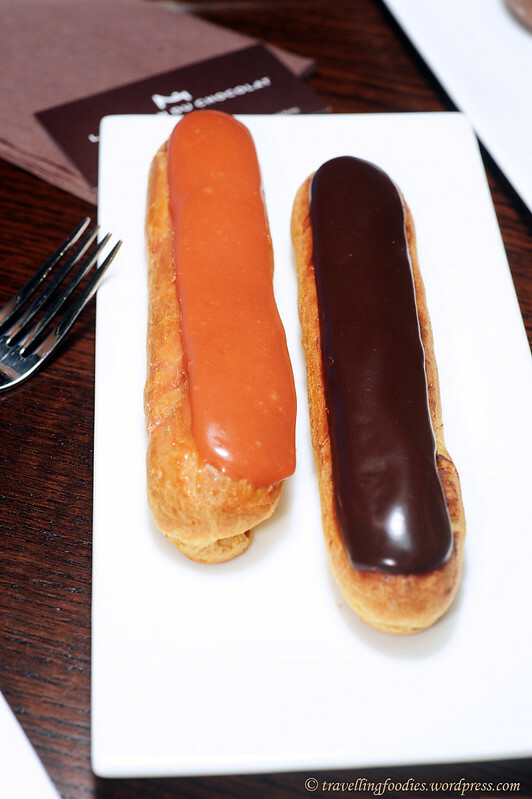 “Lastly” we also had their two eclairs on the menu. We didn’t sample the pastries in the order as they had been described here of course, but really it was a small spoonful here, a tiny nimble there, to cross check on difference in textures and flavours, juxtapositioning between one piece to another repeatedly. The choux pastry was decently made. It was not bone dry kind of crisp as I’d liked but they were not soggy and limpy like the bad ones I’d tasted. And some of these poorly made eclairs are from reputable French establishments which had recently anchored in Singapore! I was told that the choux pastries at La Maison du Chocolat were baked fresh every morning before being filled. They are not like some other horror stories we’d heard about other patisserie joints where entire eclairs were all prefabbed back in the central kitchens in France and then shipped rock frozen to the respective outlets around the world, merely reconstituted through modern technology, i.e. the microwave. Disastrous those eclairs turned out to be! 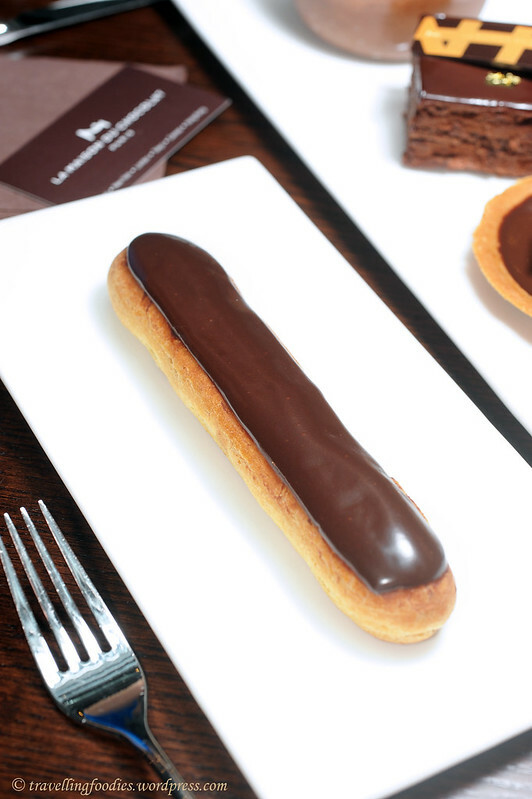 Looking very simple, just like what an eclair should be. Bewildered you all may be by my description. But have you seen deflated eclairs that looked like they’ve been stacked or stepped on, topped with a very shabbily carried out job of the chocolate glacage? Well, I have and that is almost a telltale sign of the beginning to a culinary disaster. Thankfully we see none of that in La Maison du Chocolat. 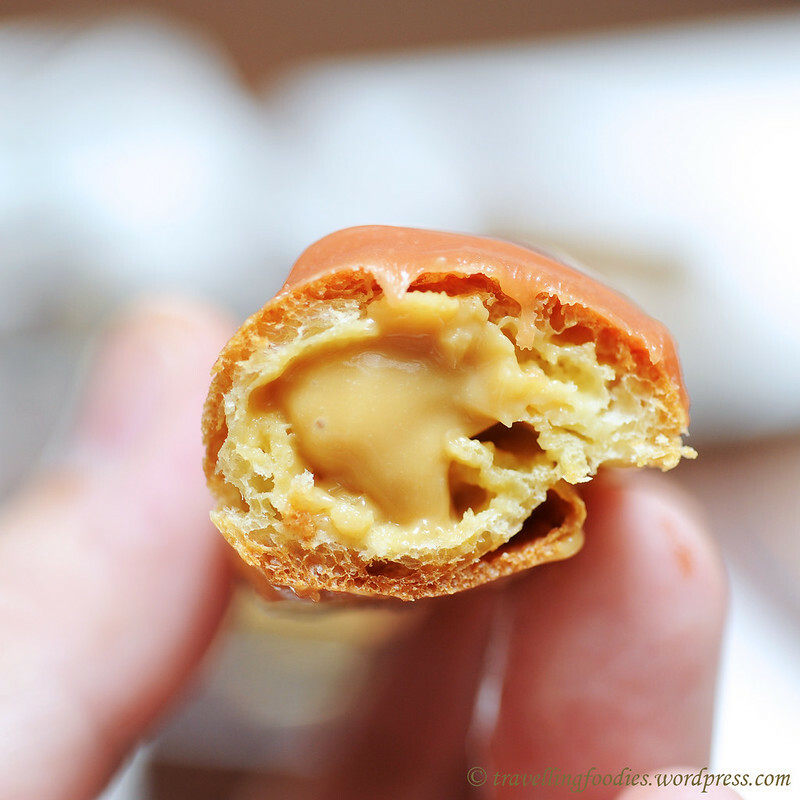 Eclair au caramel beurre salé. Such lovely flavours! The crémeux caramel filling was of the right consistency, not too thinned out to the point of oozing excessively when one gently nudges the choux pastry, nor was it too thick. The glaçage au caramel was also well executed. Right level of savory flavours from the beurre demi-sel used. Really well done! 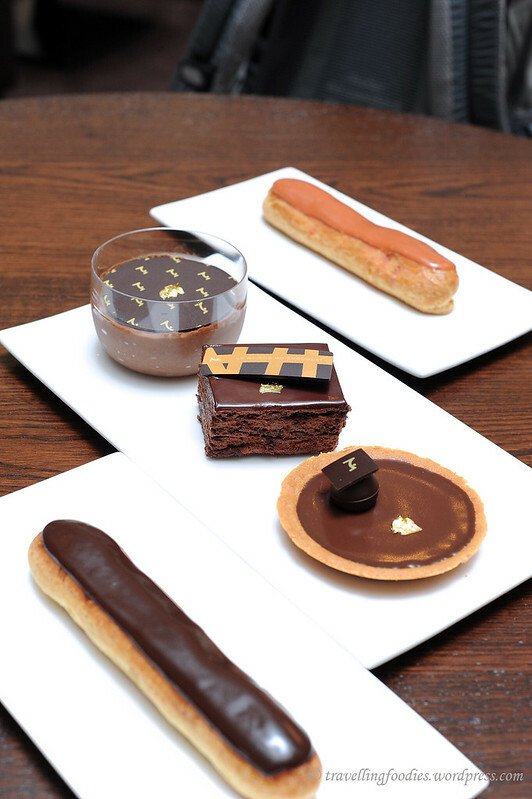 Initially we were thinking, how on earth are we going to pull through so many chocolatey desserts at one go? But it seemed almost effortless, as we ate, shot, took notes and laughed along through the sampling of these lovely pieces, mostly delicious and all very well made. So yes, I have no qualms to recommend La Maison du Chocolat to not just chocoholics, but anyone who’s up for a memorable experience with chocolate pastries. This entry was posted on November 30, 2012 by Alan (travellingfoodies). 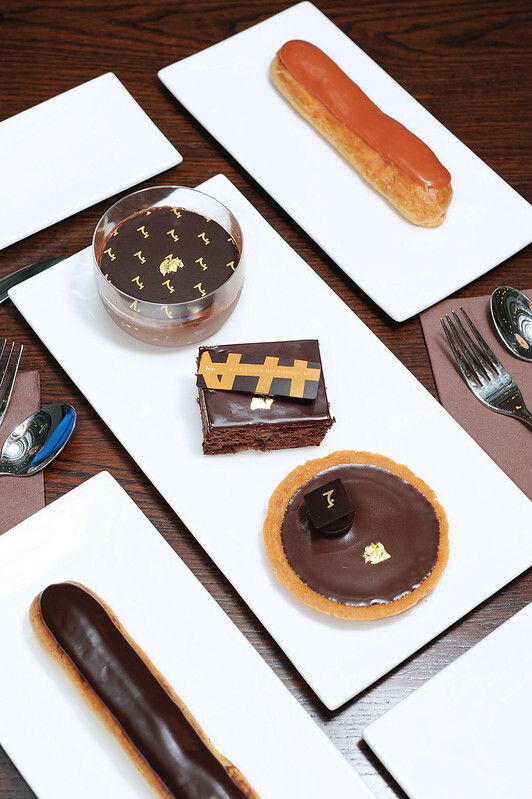 It was filed under Food, Travel and was tagged with chocolate, eclair, ganache, gaston lenotre, Hong Kong, Lee Gardens, Maison du Chocolat, salted caramel, tarte au chocolat.